After "winning" the coveted title of the world's highest paid actor in 2016, Dwayne Johnson came up just a bit short of taking home that title for two years in a row. Transformers: The Last Knight star Mark Wahlberg came out on top instead this year, earning $68 million before taxes, through Forbes' 12-month scoring period. Don't feel too bad for Dwayne Johnson, though, since he still took in a massive $65 million, just a bit more than his 2016 tally of $64.5 million, from his movies such as The Fate of the Furious and Baywatch. These numbers come from Forbes, who released their annual report of the 100 highest-paid entertainers. The site reports that the 20 highest-paid actors combined earned a whopping $720 million last year, during the period between June 1, 2016 and June 1, 2017, with the earnings estimates based on data from Nielsen, ComScore, Box Office Mojo and IMDB, along with "interviews with industry insiders." 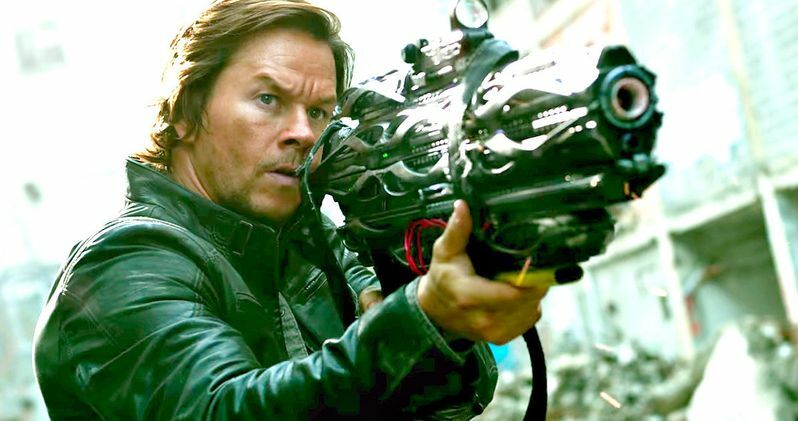 The record earnings for Mark Wahlberg were from his soaring fees for both Transformers: The Last Knight and the upcoming Daddy's Home 2, but he also has other revenue streams as well. He is featured on and executive produces the reality series Wahlburgers and stars in a series of commercials for AT&T. While The Rock may not have been named the highest-paid actor for the second year in a row, there is a silver lining in that he did manage to beat out his once-contentious co-star Vin Diesel, who were feuding on the set of The Fate of the Furious but have put their differences aside to star in the last two movies in the franchise. Vin Diesel finished third on the list with $54.5 million, a huge leap from last year where he earned $35 million and was eighth place on the list. Adam Sandler ($50.5 million) and Jackie Chan ($49 million) round out the top 5, with the top 10 comprised of Robert Downey, Jr. ($48 million), Tom Cruise ($43 million) and a trio of Bollywood stars, Shah Rukh Khan ($38 million), Salman Khan ($37 million) and Akshay Kumar ($35.5 million). This year's report also addresses the hot-button issue of gender pay disparity, revealing that the top 10 male actors earned $485 million, nearly three times more than the top 10 female actresses' combined total of $172.5 million. The top-earning actress this year was Emma Stone, who pulled in $26 million from movies like Best Picture nominee La La Land, which put her in 15th place among all actors. The only two actresses who cracked the top 20 this year were right behind Emma Stone, with Jennifer Aniston in 16th place with $25.5 million and Jennifer Lawrence in 17th place with $24 million. With Warner Bros. Wonder Woman proving to be a big hit, it's possible this could drive up the prices for Gal Gadot and other high-caliber female actresses. As for the complete top 100 list of all entertainers, which includes athletes, musicians, authors and TV personalities, Mark Wahlberg ranked 20th, with music mogul Sean 'Puffy' Combs topping the overall list this year with $130 million. He is followed by Beyonce ($105 million), Harry Potter author J.K. Rowling ($95 million), Drake ($94 million), soccer star Cristiano Ronaldo ($93 million), musician The Weeknd ($92 million), radio personality Howard Stern ($90 million), music group Coldplay ($88 million), author James Patterson ($87 million) and basketball star LeBron James ($87 million). The top 20 is rounded out by the rock group Guns N' Roses ($84 million), TV and radio personality Rush Limbaugh ($84 million), musician Justin Bieber ($83.5 million), soccer star Lionel Messi ($80 million), TV personality Dr. Phil McGraw ($79 million), daytime talk show host Ellen DeGeneres ($77 million), rock legend Bruce Springsteen ($75 million) and singer Adele and comedian Jerry Seinfeld, who both tied with $69 million.